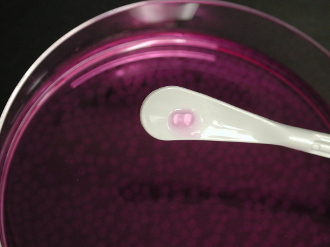 Alginate Bead Processing: Primary chondrocytes are combined with alginate gel and added drop-wise into a calcium salt bath to initiate polymerization. Alginate beads are recovered and distributed into multi-well plates or into the desired format with media supplemented with 10% FBS. Alginate bead cultures are shipped with ice packs for overnight delivery. Alginate beads are seeded with approximately 40,000 cells/bead.